Everything there is to know about us. At the heart we make our decision that leads us to our greatest purpose. Help others to navigate to their critical turning points, too. The best self preservation is group preservation. Help us establish the global divine village. Words are how we construct and create life. Improve the world by sending out words which create a more fertile and balanced world. We need representatives of ANU culture and wisdom who will model the pathways to self actualization that so many are in need of. Use your talent and genius to carve our your character with in the community of ANU Life Global Ministries. Bring all that you have been gifted with to the table so, that we may work together towards our cultural reclamation. A.L.G.M. is a philanthropic organization. We could, greatly, use your time, financial support, energy, and creativity. At ANU Life Global Ministries we embrace the worlds indigenous deep truths. We are not an all-inclusive ministry but, we do acknowledge the congruent truths that build the core principles of many of the worlds ancient spiritual traditions. As our Chief Jegna often says, “Functional spiritual systems all have the same objective. Where you see the deviation from that root is where you will find the lie”. 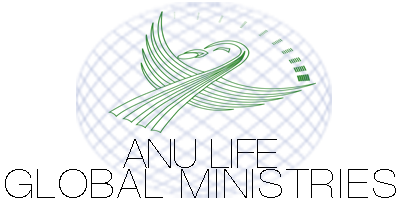 ANU Life Global Ministry is a community organization dedicated to providing high quality life enrichment products and benefits to individuals and groups, globally, by promoting the dignity and innumerable value of world cultures. Our members and ministerial staffs are committed to providing healthy bonding experiences, self-determining activities, and opportunities for vital socialization to the global community’s most vulnerable members. Your proximity to nature is your proximity to power. The ANU Life Global Ministries spiritual doctrine and guiding principles are based on what we call “The 14 Afrakan Principles”. These principles draw from the Nguzo Saba and Principles of Ma’at. The “14 Afrakan Principles” covers the internal and external work needed for individuals to reclaim their right mind, body, and spirit. H. Yuya Assaan-ANU is the founder of the ANU Nation. Head spiritual guide and leader of ANU Life Global Ministries. I just wanted to express my (constant) gratitude for the guidance, wisdom, and support I receive from you. I had my last reading on the 7th, and work with what I received there every day. Thank you Chief, and everyone else who does the work of ANU Nation. Offering much gratitude! "We hosted Yuya for a workshop and readings on March 22nd. The response was phenomenal! Everyone who attended the workshop was beyond pleased and asked me to host him again. Yuya and his staff are the most professional group I have yet to work with, great communication every step of the way. From preplanning, through marketing the event and follow-up, I could not have asked for more. I would be thrilled to host another event with Yuya!" I have been blessed to have encountered your podcast. I could have written you an email after every single show but my hunger for more prevented me. I have listened to the first year already and I cannot possibly convey in an email the emotions you have invoked in my soul. I feel like you have lit a light in a crossroad that was veiled in the dark for my minds eye. Enroll in our spiritual course at the Sadulu House. Once you complete your training you will then be eligible to test to become a minister via the ANU Spiritual Order. All events are significant. This life journey is a dream produced by your soul in order to wake your mind up to its true self. It's time for ANU Nation! © Copyright 201,9 ANU Nation.